Natural gas is proven to be an environmentally friendly source for energy production compared to coal and oil. This has been one of the driving forces in increasing the gas demand. Europe is heavily dependent on Russia for the gas supplies to meet the ever increasing energy demand. However, the recent political situation is forcing EU members to look for alternative sources of gas supplies sighting the increase in the gas demand. As a result of the increased demand many regasification terminals are now under construction or are in the planning stage. Due to various reasons transporting gas over longer distances via pipeline is not feasible. Hence the gas is first liquefied and then shipped by special LNG vessels to various destinations. Traditionally LNG is exported by means of larger vessels (145,000m3+) carrying LNG from the exporting port to the importing port. These importing ports are typically situated at locations where the local pipelines can be easily accessed and thus the gas can be pumped into the pipeline grid as required after regasification. However, in regions where pipelines cannot be laid due to various reasons, such a transportation system is not suitable. In such cases the gas has not been used as a main energy source. In case the pipelines are already available for gas transport but the draft at the port is low, bringing in such a large LNG vessel is almost impossible. This raises a need to find a solution to bring the gas in smaller vessels to meet the draft and volume requirements. Typically these import terminals are for larger volumes and the jetty is equipped to handle the largest possible ship that can call this port. Similar to the container shipping where the new terminals are built to handle Emma Maersk type vessels, a vessel that can carry around 15,000 containers onboard. The economies of scale in this industry is clear as these large vessels carry containers to a port that can handle such large volumes and then reload the containers onto smaller carriers. This is called the Hub-and-Spoke principle. 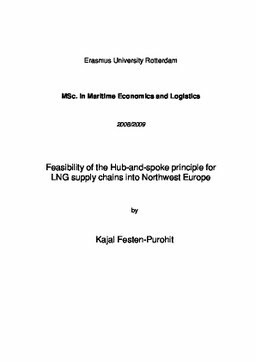 The main objective of this paper was to assess the feasibility of applying the Hub-and-Spoke principle to four European ports that have potential to import LNG in larger volumes and ship it further on in smaller vessels to various parts of Scandinavia. The paper concludes that it is feasible to apply the Hub-and-Spoke principle in LNG shipping, provided that the economies of scale can be achieved at the hub ports. In particular, for terminals like Gate terminal and Zeebrugge, where additional throughput can be achieved through the tanks with only limited incremental cost, the Hub-and-Spoke concept could present an attractive additional revenue stream.